Driving ranges are a less expensive alternative to practicing on the course. There's an old saying in golf that "practice makes permanent." Short-game guru Dave Pelz, who has taught major champion Phil Mickelson, uses the quote in his books and lessons. Although Pelz specializes in the short game, his advice about practice applies to the driving range as well. You can play better on the golf course by practicing on the range with focus and meaning. Good practice habits on the range should lead to better drives, pitches and chips during tournaments or fun rounds with your friends. But as Pelz suggests, poor practice habits on the driving range can lead to poor play on the course. That is why you should always emphasize quality over quantity during practice on the range. 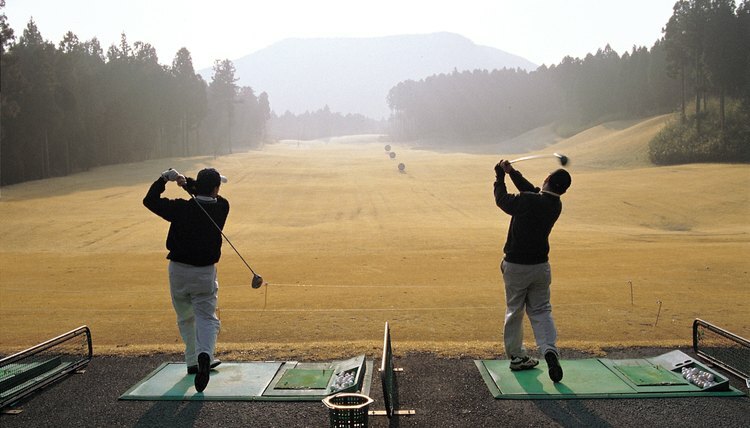 Plan practice sessions at the driving range to make effective use of your time. With an hour or two to practice, focus on swings with a wedge, short iron, hybrid and driver. Make every shot matter. Don't hack through a bucket of 100 balls. Get a bucket of 50 balls instead and play each shot as if you're on the golf course. Go through your full on-course, pre-shot routine before hitting a shot, including one or two practice swings. Play the driving range as if it's a golf course. After a warm-up period, hit a series of shots as you simulate playing a par-4 hole. Start with a driver, followed by a short iron and then a wedge to a simulated green. Then start again with the driver. Hit to specific targets. Many ranges feature small greens or landing areas marked with yardages. Test your distance and accuracy by trying to land your ball as close to the markers as possible. When using your driver, simulate a fairway by trying to land your shot between two sets of flags or markers. Spend time on the short game. Many ranges offer a putting green and practice sand bunkers. Spend as much or more time in the short-game area as you do on the driving range. Practice bunker shots, short chips and putts. Pretend your ball landed in the bunker on your second shot, and now you need a good sand shot and one putt to save par. Work on improving your clutch putting by trying to sink three 4-foot putts in a row.